The Chora Church (Turkish Kariye Müzesi, Camii yahut Kilisesi — variously the Chora Museum, Mosque or Church) is considered to be one of the most beautiful examples of a Byzantine church. The church is situated in the western, Erdinekapı district of İstanbul. In the 16th century, the church was converted into a mosque by the Ottomon rulers, and it became a secularised museum in 1948. The interior of the building is covered with fine mosaics and frescoes. 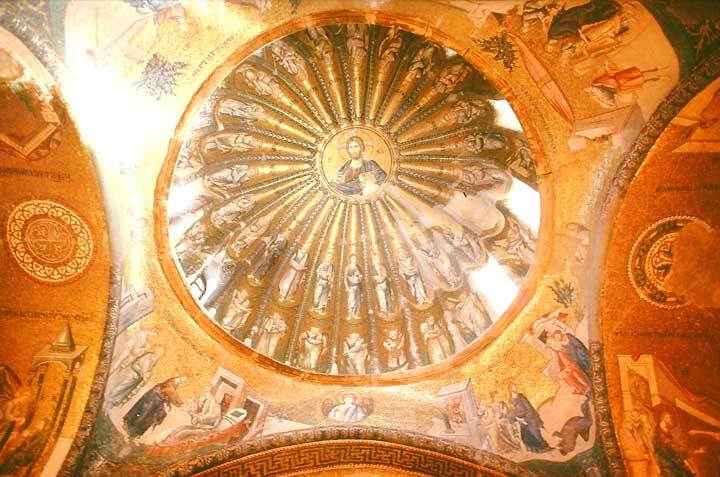 The Chora Church was originally built outside the walls of Constantinople, to the south of the Golden Horn. The church's full name was the Church of the Holy Saviour in the Country (Greek ἡ Ἐκκλησία του Ἅγιου Σωτῆρος ἐν τῃ Χώρᾳ, hē Ekklēsia tou Hagiou Sōtēros en tē Chōra). The last part of that name, Chora, referring to its location originally outside of the walls, became the shortened name of the church. The original church on this site was built in the early 5th century, and stood outside of the 4th century walls of Constantine the Great. However, when Theodosius II built his impregnable land walls in 413–414, the church became incorporated within the city's defences, but retained the name Chora. The name must have caried symbolic meaning, as the mosaics in the narthex describe Christ as the Land of the Living (ή Χωρα των ζωντων, hē Chōra tōn zōntōn) and Mary, the Mother of Jesus, as the Container of the Uncontainable (ή Χωρα του Ἀχωρητου, hē Chōra tou Achōrētou). The majority of the fabric of the current building, however, dates from 1077–1081, when Maria Ducaena, the mother-in-law of Alexius I Comnenus, rebuilt the Chora Church as an inscribed cross or quincunx: a popular architectural style of the time. Early in the 12th century, the church suffered a partial collapse, perhaps due to an earthquake. The church was rebuilt by Isaac Comnenus, Alexius's third son. However, it was only after the third phase of building, two centuries after, that the church as it stands today was completed. 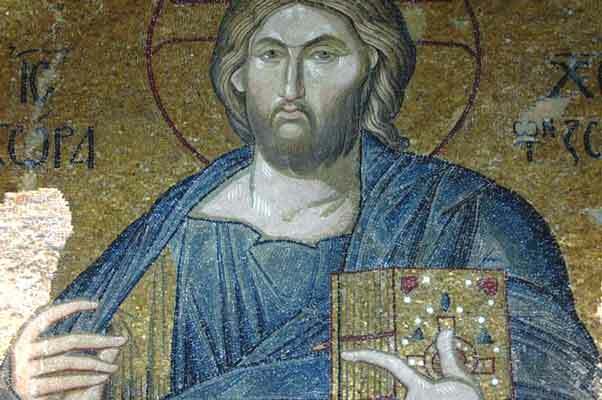 The powerful Byzantine statesman Theodore Metochites endowed the church with much of its fine mosaics and frescos. Theodore's impressive decoration of the interior was carried out between 1315 and 1321. The mosaic-work is the finest example of the Palaeologus Renaissance. However much we know of the benefactors, the artists remain unknown. In 1328, Theodore was sent into exile by the usurper Andronicus III. However, he was allowed to return to the city two years later, and lived out the last two years of his life as a monk in his Chora Church. 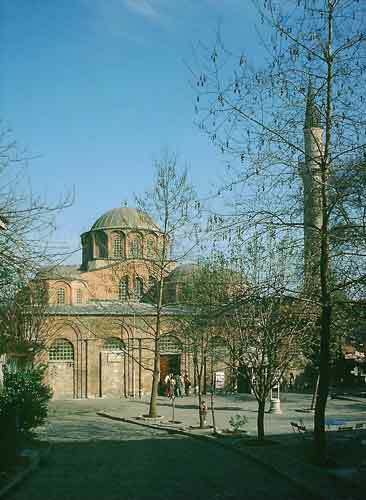 Around fifty years after the fall of Constantinople to the Ottomans (in 1453), Atık Ali Paşa, the grand vizier of Sultan Bayezid II, ordered the Chora Church be converted into a mosque — Kariye Camii. Due to the prohibition against images in Islam, the mosaics and frescoes were covered behind a layer of plaster. This and frequent earthquakes in the region have taken their toll on the artwork. In 1948, Thomas Whittemore and Paul A. Underwood, from the Byzantine Institue of America and the Dumbarton Oaks Center for Byzantine Studies, sponsored a programme of restoration. From that time on, the building ceased to be a functioning mosque. In 1958, it was opened to the public as a museum — Kariye Müzesi. 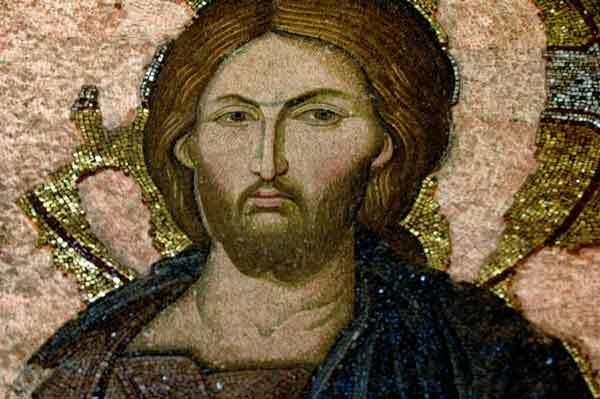 'Christus Pantocrator' inside the dome of the Chora Church. The Chora Church is not as grand in stature as some of the other Byzantine churches of İstanbul (it covers 742.5 m²), but what it lacks in size, it makes up for in the exquisite beauty of its interior. The building divides into three main areas: the entrance hall or narthex, the main body of the church or naos, and the side chapel or parecclesion. The building has six domes: two in the esonarthex, one in the parecclesion and three in the naos. The main, west door of the Chora Church opens into the narthex. It divides north-south into the exonarthex and esonarthex. The esonarthex is similar to the exonarthex, running parallel to it. Like the exonarthex, the esonarthex is 4 m wide, but it is slightly shorter, 18 m long. Its central, eastern door opens into the naos, whilst another door, at the southern end of the esonarthex opens into the rectangular ante-chamber of the parecclesion. At its northern end, a door from the esonarthex leads into a broad west-east corridor that runs along the northern side of the naos and into the prothesis. The esonarthex has two domes. The smaller is above the entrance to the norther corridor; the larger is midway between the entrances into the naos and the pareclession. Religious and noble ancestors of Christ. Joseph leaving the Virgin, Joseph had to leave for six months on business and when he returned the Virgin was pregnant and he is suspicious of that. The central doors of the esonarthex lead into the main body of the church, the naos. The largest dome in the church (7.7 m diameter) is above the centre of the naos. Two smaller domes flank the modest apse: the northern dome is over the prothesis, which is linked by short passage to the bema; the southern dome is over the diaconicon, which is reached via the parecclesion. 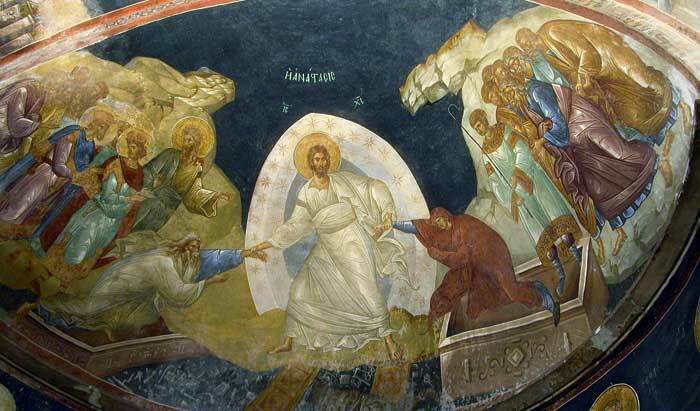 The Anastasis fresco in the parecclesion of the Chora Church. The Monastery of the Holy Savior in Chora, Ecumenical Patriarchate of Constantinople. Kariye (Chora) Museum, Istanbul, Turkey Travel Planner by Tom Brosnahan. Kariye Museum, Governorship of Istanbul.